Attention high school singers: If you will be in grades 9 -12 in 2019-20, love to sing and are ready to commit to rehearsing and performing with an award-winning high school a cappella ensemble, audition for `Til Dawn this Spring! Read on below for more information and a link to our audition registration form. 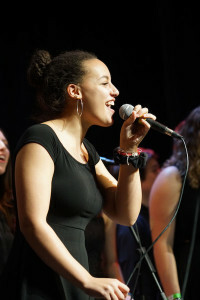 Anna at the 2018 Sing Out! This one is a hard one to answer. It’s partially dependent on turnout, but we encourage you to be ready to stay until 10:30pm. Don’t worry though, rehearsals are never this late. Please bring a snack for yourself and a coat in case it it cold.